This article is about the Donkey Kong level. For other uses of the term "100m", see 100m (disambiguation). 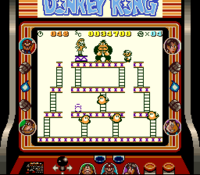 100m (or 100 m) is the fourth and final level of the Donkey Kong arcade game and the final level of World 0 in Donkey Kong for the Game Boy. This level is different from all the previous levels, as Mario now has to pull out the bolts attached to the steel girders holding up Donkey Kong, rather than getting to the top. To do this, he must simply walk or Jump over the yellow bolts, and they will disappear. Fires will randomly begin to appear. Fires will chase after Mario and try to kill him. Several hammers are located around the level and can be used to destroy the Fires, although more will eventually be summoned. There is a maximum limit of five Fire sprites onscreen in the arcade version and four for its NES port. In the Game Boy game, this is where Pauline's Bag appears. A related stage appears on the Game Boy Advance remake, which is shorter due to the screen size and low quality. Once Mario has disabled the eight yellow bolts (six in the Game Boy game), the middle girder will collapse, and Donkey Kong will fall down to the bottom, banging his head on the ground. Mario will rescue Pauline and a heart will appear. In the original game, the game ends here and repeats itself. All following levels with have 100 added to their number, starting with 125m, despite being the same as 25m. 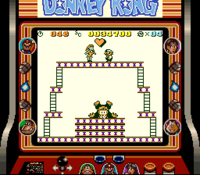 In the Game Boy game, Donkey Kong will stand up again and grab Pauline again. He will then escape with her into the Big-City, with Mario following the two. Bag: On the lowest girder pass the ladder in the middle. Hat: Under the ladder on the second girder on the right. Parasol: On the highest girder where Donkey Kong stands on the left. Note: The bag is on the second girder on the left near the bolt, while the hat and parasol are absent in the Game Boy game. After the level is completed, it plays out just like the original game, except instead of ending, Donkey Kong gets back up, causing the ground to shake, breaking the girders Mario and Pauline are on, causing them both to fall. Mario just hits the ground but Pauline gets caught by Donkey Kong who makes an escape with Mario chasing after him. The scene then cuts to Donkey Kong running into an open door. Donkey Kong closes and locks the door just before Mario could enter it, causing Mario to crash into the door and become dizzy, then the key falls from the sky, which Mario then grabs and takes to the door, unlocks it and enters, ending the cutscene. The player is then given lives based on their score. A glitch in this level allows Mario to "taunt" Donkey Kong. If Mario stands next to him and jumps, he is awarded 100 points per jump. Touching DK is fatal, and the glitch serves no purpose unless the player jumps twice per second, as the timer removes 100 points per second. Another glitch can cause a Fire to get stuck between two platforms if Mario removes a rivet underneath the enemy as they are programmed not to fall from platforms. This page was last edited on April 12, 2019, at 04:13.